Top photo: UTSA education majors use latest technology to teach students at Las Palmas Elementary. Bottom photo: Students communicate with education leaders in Austin via Skype. >> View a compilation of news videos on the project from KABB-TV and KWEX-TV. (June 17, 2010)--"La Clase Magica," a pilot program sponsored by the UTSA Academy for Teacher Excellence, completed its first year and organizers are hailing it as a huge success. The bilingual educational training program aims to enhance the academic achievement of minority children from low-income families by exposing them to the latest technological advancements, which can help them achieve success. In fall 2009, 20 education majors equipped with iPhone smartphones and Netbook mini-laptop computers paired with Las Palmas Elementary School students in the Edgewood Independent School District in an after-school program to create educational videos. In spring 2010, the program set up a private chatroom, and a new set of 20 education majors taught students how to communicate with their classmates using the technology. Through the process, the children improved their reading and writing skills. "We have noticed that the children are becoming a lot more verbal, and it is translating into the things that they are writing," said Mari Cortez, UTSA associate professor of interdisciplinary learning and teaching. "In the beginning, the students were very surprised that they could talk with one another that way without ever seeing each other." But, it's not only the students that benefit from the program. The UTSA education majors take away something as well. "This program introduces us to technology that we can take into the classrooms after we graduate and become teachers, said Trina Taylor , a mother and 25-year-old senior education major from Boerne. "I enjoy seeing the kids get so excited when they learn something new, and you just see that light bulb go off in their heads." News of the program's success is starting to spread, and educational leaders at UT Austin plan to develop an after-school program. 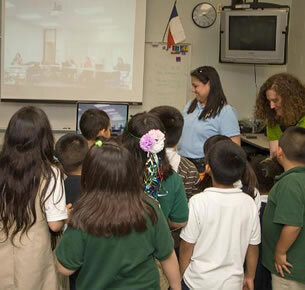 Recently, San Antonio elementary students and UTSA education majors communicated via a Skype teleconference with the interested parties in Austin to describe the pilot program. The "La Clase Magica" program also benefits parents are also enjoying the chance to learn to use the technology and spend more time interacting with their children. Viviana Trujillo, a mother of two, created an interactive book on the I-Phone and printed it out to take home with her and read to her kids. "I can see us being more active as a family, sitting down and being creative using our imaginations with words, instead of just watching tv." The "La Clase Magica" program in the UTSA College of Education and Human Development is modeled on a program developed at the University of California at San Diego in 1989 by Olga Vasquez. It is funded through a $2.5 million grant from the U.S. Department of Education, which covers several programs in the UTSA Academy of Teacher Excellence.